It’s the difference between know how and know why. It’s the difference between, say, being trained as a pilot to fly a plane and being educated as an aeronautical engineer and knowing why the plane flies, and then being able to improve its design so that it will fly better. Clearly both are necessary, so this is not putting down the Know-How person; if I am flying from here to there I want to be in the plane with a trained pilot (though if the pilot knows the Why as well, then all the better, particularly in an emergency). The difference, also, is fundamentally that Know How is learning to Think Other People’s Thoughts, which indeed is also the first stage in education—in contrast to learning to Think Your Own Thoughts, which is why Know Why is the final state of education. Indeed, both Know How and Know Why are essential at one moment or another, and they interact all the time; but at the same time, the centre of gravity of education is and must be in the Know Why. The Phi Kappa Phi Journal, Spring 2000, p. 46. (author unknown). Recently I was chatting with a colleague about some of the strangest things we had been involved in over the years as business consultants. I told him a story about the time I was asked to deliver education to a group of miners in Africa. The objective of the course was to improve their supervisory skills. What made the class interesting was that the miners spoke little or no English and I did not speak their language. Furthermore, the class was to take place about a kilometre underground in what could only be described as a cave. It had no electricity, no chairs, no tables, no flipchart, and no whiteboard. It was just a hole, in a hole, deep underground. The class had to be underground as the miners were only allowed a short time away from the working face. To deliver the class, I prepared a storyboard on a large and long strip of brown paper, rolled it up, and went down the hole. In the cave I hung the storyboard with some wire I found hanging from the roof. When the participants came in, the only lights we had were the headlamps miners wear underground. This meant that for them to see the material they all had to switch on their lamps and stare at the storyboard. This actually provided a good way of knowing when their attention drifted, as they would turn away and the light would go out. I worked with an interpreter and we delivered a successful course. The students had been identified as potential supervisors and the underground course was part of a program aimed at building the overall basket of skills they would need to become productive supervisors. The program was delivered in two phases. The first phase was education and focused on creating an awareness of the concepts and vocabulary typically employed by a supervisor. The second phase was training. The focus was experiential learning in a live environment; the active transfer of skills. To this end I spent hours working “on the floor” with each of the supervisors, supporting them individually as they learnt their new roles. The outcome was that mutual respect between the miners and the new supervisors was quickly established. Collectively they soon became an effective team and the client received an excellent financial return. For me, what made this project different is that it went against the norm. Frequently when staff are promoted from the floor to the supervisory or managerial positions, they are not educated or trained in how to operate in their new roles. This invariably means that the organisation loses a good worker and gains a poor supervisor. Educating and training the miners on how to supervise ensured that the mine not only gained a team of supervisors who had a first-hand understanding of the daily working environment faced by the staff, but also a team who understood what was required to effectively supervise the staff. The experience really taught me that staff (human capital) should always be developed through a holistic program that combines education and active training. Education provides the framework and context. It explains why something is important—the sessions in the cave. Training develops technique, skills, and tactics as evidenced by working “on the floor” with the supervisors. The term “on the floor” means exactly that—working with the employees, including managers, in the live environment. Relying on generic training exercises in the classroom as a substitute for “on the floor” experience is a far cry from working with each student directly on the job as they actively learn to address real operational issues. 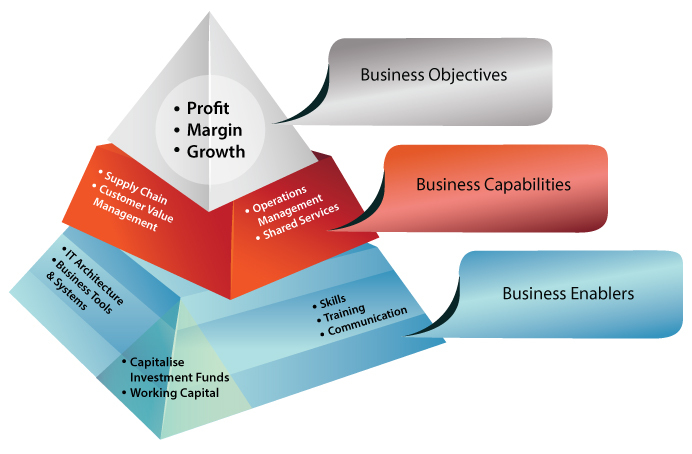 From a big picture point of view and as illustrated in the graphic, business objectives are delivered through the capabilities of the organisation. Capabilities are themselves created from a blend of the enablers of finance, technology, and the human capital. When it comes to building human capital there really is only one objective—to cause a change in behaviour. A change in behaviour means doing things differently because of new skills or because you see the world differently. When constructing a program to develop human capital, it is important to be clear on which business capabilities need to be created or augmented and how the new behaviours will support the business capabilities. No matter whether the intent is a skill or a knowledge transfer, there is an important hierarchy that needs to be acknowledged—organisational learning “sits” above individual learning. Equally important is the difference between the learning attributes of the organisation and those of the individual. Organisations can be educated, in the sense that they can have memory and retain knowledge. Organisations cannot be skilled. Individuals can be educated and skilled. 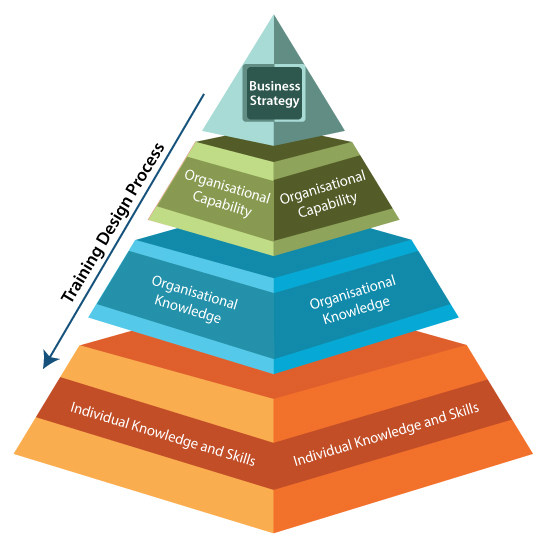 Acknowledging the hierarchy and the learning attributes of each part is vital as they directly inform which stakeholders need to be engaged as part of any human capital development program. Consider the following scenario. As part of normal business practice, the sales and marketing team meets clients and receives orders which they then pass onto the production department. The production department translates the request into finished goods. The production manager seldom, if ever, meets the customer. To keep up with best practice, the production department sends an engineer on a training course as a refresher on the latest production techniques. This is effectively a reskilling of the engineer. It is easy to see how the separation of duties could result in the production department not considering it relevant to inform the sales and marketing team of the engineer’s refresher training. If the sales and marketing team does not know that the engineer has an increased skill set, they will not change what they sell or how they sell it and the business will not make a meaningful return on its investment in the engineer’s development. To mitigate this risk, the process of arranging training for the engineer should include an organisational education component to drive organisational learning. This raises the question—which stakeholders need to be educated to meet any given organisational learning objective? The following table can assist. The impacted stakeholder columns capture which functions are directly and indirectly responsible for ensuring the business capability is created. The difference between the two is critical in that indirect stakeholders rely on the direct stakeholders to inform them of newly created capabilities and direct stakeholders rely on the indirect stakeholders to maximise the potential created by the enhanced capability. In the above example, the production function is the directly impacted stakeholder and the sales and marketing team is the indirectly impacted stakeholder. Other indirect stakeholders could include the up and down stream functions in the value chain. When it comes to realising a return on investment from the capabilities created by a human development program, perhaps the most important development activity is educating the business that the new capability exists. Allied to this is the key question: is the direct stakeholder equipped to manage the up-skilled resource? All too frequently after a development program, I have heard managers telling their staff words to the effect of “this is the real world” and they “should forget that academic mumbo-jumbo and get on with the job.” Simply put, for the business to fully realise the benefits of the development program, it may be necessary to require the manager to attend a course on management techniques. This highlights the importance of the business impact columns. Frequently courses are measured in terms of attendance and student satisfaction. These are good measures of benefits to the students themselves, but they tell you nothing about the effectiveness of the course itself. The true benefit of the program should be measured through changes in key business indicators such as revenue, margins, yield, utilisation, productivity, quality, and scrap. Linking the measurement of course effectiveness to key business indicators requires a much deeper understanding of the impacted stakeholder community. This requires an understanding of the corporate scorecard and, by extension, the wider stakeholder (direct and indirect) community. As discussed previously, a development program must align the learning outcomes to the business objectives, thereby providing context for the sessions. I recommend using the following table. The first two columns provide the context for the human capital development program and collectively they link the course outcomes to the business capabilities. It is one thing to know why and what you need to do and another thing to know how to do it. This gap exists because while knowledge can be retained at the organisation or team level, skill can only be captured at the individual level. The problem is that individuals leave, taking their skills with them. To mitigate this, all human capital development programs should include a component that will actively contribute towards infusing the organisation with knowledge, thus reducing the reliance on a specific individual. 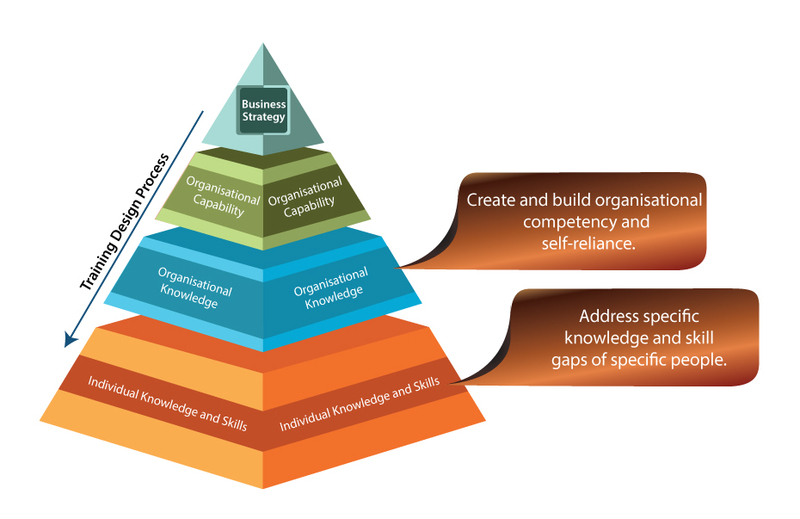 This reinforces why Organisational Knowledge sits above Individual Knowledge and Skill in the hierarchy. The three learning outcomes will ensure this happens. The first column defines the specific skills an individual will acquire. The second column defines the knowledge the organisation can expect to gain as a result of the skills improvement program. It should include knowledge gained by direct and indirect stakeholders. In the event that there is no skills development program, then column two will be completed accordingly. Describes the tangible differences expected as a result of the program and will inform columns one and two. Answers the question—how differently does the organisation need to behave in order for it to benefit from the investment in columns one and two? It should be tied to the business benefits. Reinforces the universal point that no matter what the improvement initiative is, it will require an understanding of the wider stakeholder group and their interests. This entry was posted in Stakeholder Management and tagged education, human capital;, knowledge, training. Bookmark the permalink.